There are many valuable reasons why companies record telephone conversations and Xtension Recorder supplies you the highest quality recorder. Using Comvurgent’s ‘True Digital’ technology, Xtension Recorder stores conversations in the same high quality format as your digital telephone ensuring excellent sound quality. Xtension Recorder simply connects in line with digital PBX telephones and plugs into the USB connector on any PC. The Set-up Options allows you to record all calls or manually select which to record. It also allows you to compress the files to save disc space and save calls locally or on a network server for centralized monitoring and playback. And the Xtension Recorder can be used to record a message instead of writing it down. The Xtension also helps you monitor those important callers and making sure that they are answered and transferred. 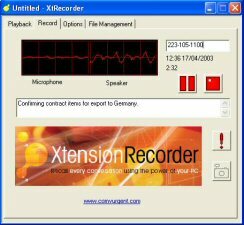 Xtension Recorder allows you to dictate directly into your phone and e-mail the recording to an assistant. XtR Desktop can also be invisibly installed on Call Center agents desktops to record calls over a network to a central server for supervisor listening. Record on local PC or centrally on server over network. Also with Xtension you can use lockout (invisible), hide features (no user intervention), set auto delete for non important calls, auto prompt for comments/notes on each call, and select email export format of recordings. The Digital 01 and Universal US Adapter comes as standard supply and the GSM compression gives 170 hours recording per GByte. The time and date is stamp on every recording and the snapshot feature allows you to playback the current call while still recording. Xtension Recorder BackOffice is the entry level centralized storage solution designed for small business's and call centers wishing to record calls centrally. Xtension Recorder BackOffice is designed for companies who don't require the extensive storage, archive and advanced search facilities of Xtension Recorder Professional. Customers investing in the BackOffice solution can upgrade to XtR Professional easily and quickly and cost effectively. XtR BackOffice Server - central storage of calls using BackOffice Digital 4/96 or multiple Desktop Digital 01 connectors. XtR BackOffice Supervisor - Supervisor monitor & playback of centrally recorded calls. Note: It is possible to use XtR Desktop software located on each agent PC in 'invisible' mode to record calls to a central server, and to monitor and playback recordings using BackOffice Supervisor installed at the supervisors desktop. Xtension Recorder Professional is the premium call center solution designed for multi agent and multi supervisor operation. Centralized storage and archival management makes it easier to keep files organized and the password authorization helps keep it secure. The Xtr Professional incorporates application database (MDSE included) and supports multiple arcive such as: CD, DVD, DAT, ZIP, etc.